It will help residents decide which bin they should put their waste in. The animation, which has been overseen by a group of councillors on the “informing and engaging our communities” task group, is the first of its kind and has been designed to reduce the amount of recyclable waste put in the black rubbish bin and reduce the amount of contamination in the blue-lid recycling and green garden waste bins. The task group heard that residents in Rugby produce less waste than residents in other parts of Warwickshire, and put less food waste or garden waste in their black rubbish bin than other district and borough areas. Cllr Dale Keeling, who chaired the task group, said: “The task group was pleased to see that Rugby borough residents do take positive action to recycle their waste when compared with other districts and boroughs, but still noted that there was more that could be done to influence recycling habits. “The latest data from the Warwickshire Waste Partnership shows that traditional behaviour change programmes have had little effect so far, so the task group wanted to see if a completely new approach might have more impact. Cllr Lisa Parker, Rugby Borough Council portfolio holder for the environment and public realm, said: “While it is pleasing to hear that our residents are more careful about how they recycle than other parts of the county, and put less food and garden waste in their black bin, recycling more and using the correct bin saves money and helps the environment. 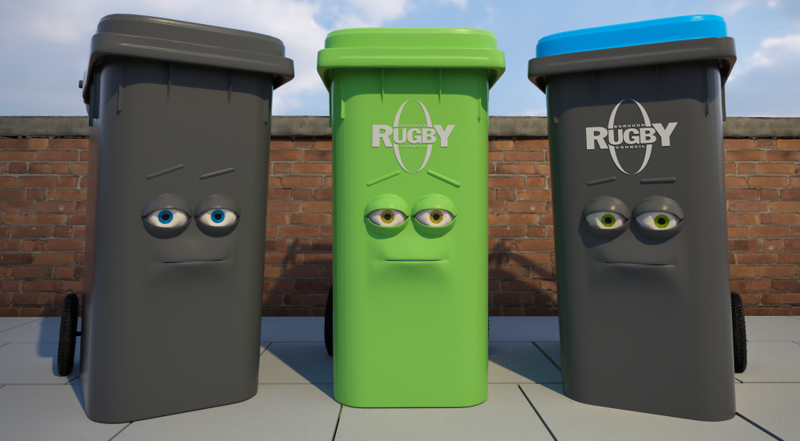 The three bins animation can be viewed at www.rugby.gov.uk/whichbin. The web page also includes more detailed information on which bin should be used for different types of waste alongside details of the Warwickshire Waste Partnership data on waste generation and bin composition. The animation has been put together with the help of Quidem Media, whose analytics will be used to show the animation to residents via social media and other digital channels.